1. Head towards the airport exit. 2. Take the VA Route 28 exit (number 9) South towards VA-7/Sterling/US-50/Centreville. 4. After about 10 miles, take the I-66 West ramp towards Front Royal. 5. Merge onto I-66 West. 6. Ten more miles, take the US-29 exit (number 43B) South towards Gainesville/Warrenton. 7. Keep LEFT at the fork in the ramp. 8. Stay straight to go onto US-29 South. 9. Stay on 29 South for about 80 miles. 10. 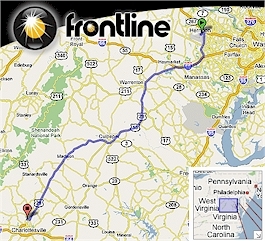 As you approach Charlottesville, you'll pass a built up area with a lot of stores (Wal-Mart, Lowe's, etc.). Once you've passed Walmart, move into the right lane. 12. Stay on W. Rio Rd for about 1 mile. 13. After you have driven through 2 stop lights, turn LEFT at the entrance to West Park Plaza/Rio West. Rio West Building is on the right side of the parking lot. 14. Enter the Rio West Building, the stairs to our office are on the right side of the lobby. At the top of the stairs is our office. Please ring the doorbell and someone will come to open the door.